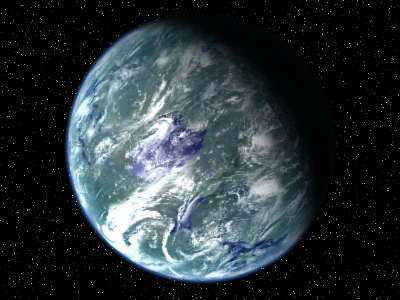 The Forest Moon of Endor is the second planet in the Endor System. Secluded in a remote corner of the Outer Rim Territories, the gas giant Endor and its verdant moon of the same name would easily have been overlooked by a busy galaxy were it not for the decisive battle that occurred there. Endor is one of nine moons orbiting a lifeless gas giant in the Moddell sector. A convoluted hyperspace route and the enormous gravity well of its mother planet renders Endor a difficult place to visit, making it an ideal secret construction site for the Empire. Though known as the forest moon, Endor has a wide variety of terrain. Forests cover much of the satellite, but there are also stretches of savannah and desert, as well as frozen ice caps. The moon is teeming with life, including sentient beings such as the Ewoks, their distant cousins the Duloks, and subsentient aliens known as Yuzzums, Goraxes and Teeks. The forest floor becomes a dangerous hunting ground at night, when feral boarwolves, hanadaks and preducors stalk the wilderness for prey. The silvery gas giant is occasionally eclipsed by the winged silhouette of a mantigrue, a harbinger of the evil Night Spirit in Ewok lore. Endor was the secret construction site for the second Death Star. Code-named the Sanctuary Moon, Endor was a green jewel that stood out against the dark reaches of space. Rivers wind through the thick canopy of ancient trees, and the forests extend high over the dark floors and the low mountains of the world. Built in a clearing on the moon was an Imperial installation protected by an entire legion of Imperial troops. A massive shield generator projected a deflector shield around the half-completed Death Star. A daring Rebel strike team, under the command of General Han Solo, was assigned to destroy the generator. With the assistance of the native Ewoks, the Rebels defeated the Imperial troops, paving the way for a victorious space battle. This historic engagement is known as the Battle of Endor. Endor serves as the gravesite of both Emperor Palpatine and Darth Vader. It was here that the Rebel Alliance began the path of victory over the Galactic Empire. Following their victory at the Battle of Endor, the Rebel Alliance stationed there for a brief period, launching missions under their new name of the Alliance of Free Planets. They eventually relocated, leaving Endor to its quiet existence. Though some intrepid Ewoks left the moon, most stayed behind to live simpler lives. A small trading outpost run by a being known as Salfur keeps open the connection between Endor and the galaxy at large.